Fabulous, I love this idea! Please don't include me in the giveaway (I am stocked) but I will definitely be doing a version of this. First I apologize for helping you go off the wagon...but it was good stuff wasn't it? Second...I have a thing for mustard; just love it. And you have done a fab job of incorporating it into not just a yummy treat but one that fits your program. Bravo! Good luck with your diet!!! I know how hard that is and applaud you for doing it. Your French hens sound delicious and cheesy good! 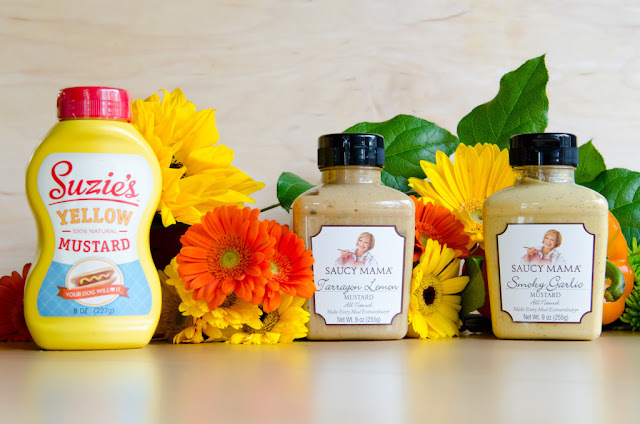 I'm a mustard addict and think the Saucy Mama Mustard sampler would be a great thing to win! Dear Ms. Not Chubby: Lean meats and veggies are such a good way to eat. And throw in some mustard and sounds perfect to me. As you know I'm a fanatic and would love to try the sampler. An inspiring post with a healthy recipe is a sure winner. I am bookmarking this page... Keep working on it! It will all be worth it. I am loving this recipe! Looks great! Thanks for sharing. And these mustards sound great! I love finding condiments with nice flavors already mixed in! Who says a diet can't taste and look good. This sure does in both counts. Random.org chose lucky #7 for my winner. Congrats Ansh! I'll be contacting you soon for your delivery information. You're going to love this mustard.